If you're looking for a high protein, high fiber packed salad then this is for you. It contains two of the most healthiest grains: Quinoa which is packed with protein and contains all the escential amino acids and Wheat Berries, which contain the entire wheat kernel (the bran, germ and endosperm) making it an excellent source of fiber. And with the addition of mango, red bell peppers and dried cranberries, it's a good source of Vitamin C as well. 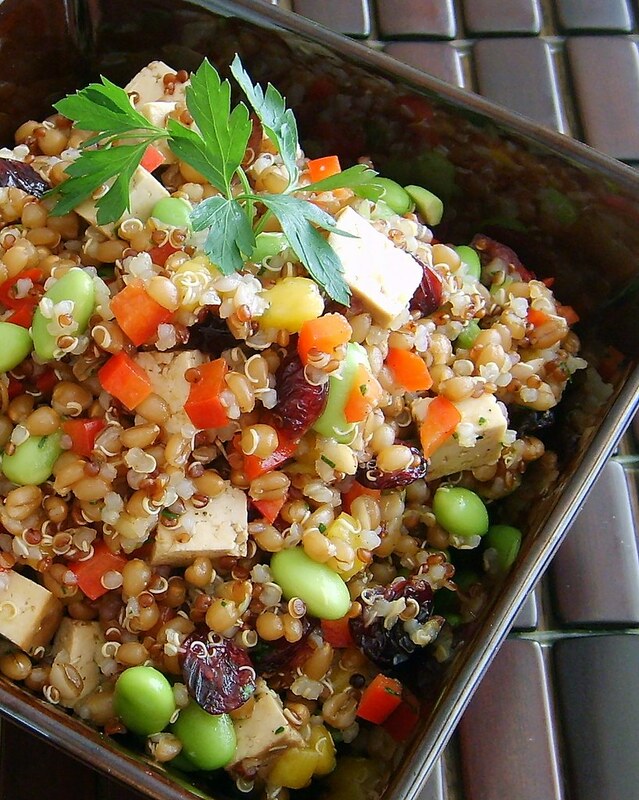 Since there's so much protein in this salad from the grains, you can leave out the tofu, but I like the texture it provides. It's not necessary to soak the wheat berries overnight prior to cooking. I find that they take about 50 minutes or so to cook regardless if you soak them first or not. Place wheat berries in a 3 qt sauce pan, cover with lots of water, bring to a boil, reduce to a simmer and cook until kernel starts to split/open, about 50 minutes. You really can't overcook wheat berries, but you can under cook them so taste them and see if you like the texture. Drain really well and set aside. Wash quinoa under running cold water for a few minutes to remove any bitterness. Place in a 3 qt sauce pan and cover completely with lots of water. Bring to a boil and reduce to a simmer until kernels start to open, about 20 minutes. Pour quinoa into a strainer and rinse with cold water and then let sit for 10 minutes to remove excess moisture. Fluff with a fork and set aside. Toss wheat berries and quinoa together in a large bowl and place in the refrigerator to chill while preparing other ingredients. Add all other ingredients to mixture, including vinegars and oil, toss really well and taste for seasoning. You may need additional acid or oil, salt and pepper. This recipe is fantastic! Even my really picky 8 year old loves it.